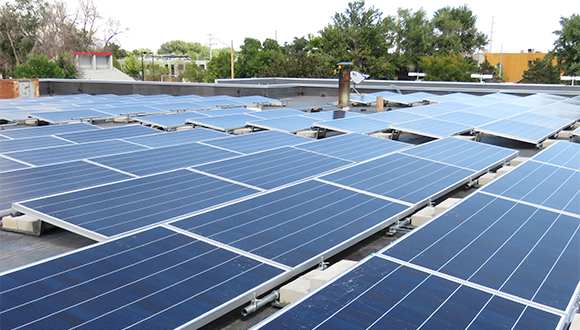 Working with Independent Power Systems (IPS), Boulder Nissan made the strategic decision to retrofit its lighting and install solar. The combined energy efficiency and solar project is expected to save the dealership nearly $400,000. On average, auto dealers consume 18 percent more energy than a typical office building, facing nearly $2 billion in energy costs annually. What if you could eliminate that cost? Let our team of seasoned experts help you plan your solar project. Connect me with an expert on solar for business. 1 SunPower 327W compared to a Conventional Panel on same sized arrays (260W, 16% efficient, approx. 1.6 m2), 3% more energy per watt (based on 3pty module characterization and PVSim), 0.75%/yr slower degradation (Campeau, Z. et al. "SunPower Module Degradation Rate," SunPower white paper, 2013). The solar system offsets Velocity’s electricity for showroom lighting, service department and air conditioning.